Q. What was MCA's original expectation for the Catholic Girls? What had the band been told to expect? A. Actually, we weren't told to expect anything. When we were signed, we did expect to have a say in our producer which we didn't, and that proved to be disappointing. We also thought that MCA would get behind us more when it came to tour support and promotion but after the album was released, although 99% of the reviews were really fantastic, they were also getting some friction when it came to airplay because of the name The Catholic Girls, the school uniforms, some of the lyrics and the top level execs at MCA basically refused to give us tour support so that we could open for Adam Ant (very hot at the time) and they actively decided to go light on the promotion. Promotion in the record business at the time basically meant throwing lots of money into radio station “support”. Promotion could mean various forms of gifts, favors, and lot more. Can you call it “payola” in the classic sense? Who knows? Its one of those mysteries behind the music business, whispered about, rumored, but unsubstantiable. Nervousness about our religious overtones did have an effect as well. Early on we were in the process of scheduling an appearance on Saturday Night live (which would have been a giant springboard for us) but SNL suddenly cancelled us out claiming too controversial. Too controversial for SNL. Really? Obviously this was a blow for us (yes, I wish SNL make that one up for us now that years have passed and we’re not viewed as so dangerous. Then, MCA got taken over by Iriving Azoff (who used to manage The Go-Go's at Front Line Mgmt.) and most of the staff (including all the people who had signed us—and truly were behind us in many, many ways) were let go. In fact most of the artists were let go. It was a massacre in many ways. That said, they wouldn't pay to make a video for MTV, which we did ourselves on a shoestring, nor “push” too hard at MTV or other video, or radio stations to keep playing us and we couldn't afford that ourselves, and again, that’s the mysterious world of “promotion”. And “mysterious” may be an understated way of saying “completely hidden.”. Finally, Azoff and company wouldn't give us the next album like we expected [and were actually already told we would get]. As a new artist, you learn a lot about “promises” the hard way and have to swallow some bitter pills along the way; you learn and hope to survive. Some survive, some don’t. It's a shame though, because several record companies (with a bit more internal creativity and conviction) were very interested in us at the time MCA signed us. It was only later that we learned that MCA had the nickname—Musical Cemetery of America. Q. Was the phrase "the next Go-Go's" ever uttered by anyone? A. Well, this is actually a really good question, not asked too often, and most of the time I say little on the subject. But for once, I think I’d like to. When MCA signed us, we actually weren’t expected to be the next Go-Go's. The timing of the records release was close, but coincidental. Once our record was released, however, some odd rumors and innuendos did start to surface on several fronts in several ways. At one point early on, we were reviewed for a show in LA and the reviewer kept mentioning that I had a ton of make-up on (said I packed it on with a trowel) and he mentioned virtually nothing about the music. In fact, the crowd at the club absolutely loved the show (encores and so on…). We later found out that the reviewer was best friends with Belinda Carlisle. Suspicious… maybe. Belinda to blame? Doubtful at best. But the “girl-fight” fires were brewing, and some of the press did make comparisons, but most were positive and most were nice enough did note the definite differences between the sound, style, and musical POV of both bands. In some ways, some people in radio, media, the labels, and the listeners were almost trying to start some sort of feud, which not only was never on our minds but simply wasn’t true. We had never had any contact with the Go-Go's, overall their music was fine with us, it was definitely well done and they were already at the top of the charts and we had nothing against them. One of things asked repeatedly of us about the Go-Go's was “we heard the Go-Go's didn’t really play the instruments on their first album”. Is that true? And did you play your instruments? Interesting question I’ve rarely heard asked of all male bands. Back then, I probably should have asked the questioners, “would you ask us that if we were men? So, let me answer this now, firmly and succinctly. I have no idea about the Go-Go's. I don’t know and have no “inside information” and its not my business. I wasn’t there. They say they did and I have no reason to doubt that. The Catholic Girls I can answer for. Yes, we played every note with the exception of two synthesizer passages on the album (because the producer brought in a technologically far beyond me keyboard I didn’t understand worth a damn; a studio musician played on those passages). PS on that. I played my own keyboards in all live shows. And since that first record, we have played every note, every instrument (keys included), every passage AND we do all of our own arrangements as well. The only thing I can say about the Go-Go's as a criticism and a simultaneous wish is this: back in 1982 after our album release, we were scheduled to play a live show at a large club venue. We would open the show. They would headline. The day of that show, we received a message that the Go-Go's had cancelled their appearance that night. We ended up headlining that show. In retrospect, I wish they had not cancelled; I think that would’ve been great fun and I’d still be happy to play with them anytime in any venue large or small. We would obviously open for them and we’d be glad to do so. I’d even consider pulling out the old keyboard (we don’t bother with it these days) and even open our show with “God Made You for Me”. Feud brewing? Fight? Sour grapes? No. No feud. No fight. But… well… maybe just a little years old sour grapes. I can’t help it. Q. How did you get to open for the Kinks and Tom Petty and the Heartbreakers? A. This was due to our booking agency ICM at the time. They were able to get us some terrific opening slots. We opened for The Kinks on New Years Eve in NYC and we had a blast. The owner of the club (Roseland), was worried we'd be eaten alive by the crowd because Kinks fans are really Kinks FANS. Another opening act was “boo’d” and pelted onstage by food, bottles, trash and the like until they left. He was nervous. But, we went out there, started playing and instead (after a few food items were thrown), the audience soon loved us and in fact gave us an encore! It also turned out that Ray Davies was watching the whole show and really liked it, and was nice enough to come to our dressing room to tell us that he loved the show! Q. Were you surprised by how things turned out? A. Being young, I was surprised that MCA’s higher-ups didn't back us the way they promised when they signed us. New artists may be a bit naïve but they do have some positive expectations when the critical praise overall is as overwhelming as ours was. A video at the time and of course, airplay and promotion would have made the band. We were good enough to “last” and grow and it would have (on a purely business side), been a good investment. We had nothing but good reviews in tough publications like Billboard, R&R and The Hollywood Reporter but we would only get on radio stations sporadically and insiders knew (as we found out) that MCA wasn't willing put their full weight and capital behind promotion and pushing us past some of the controversy which years later, became less dangerous. Q. I remember being sort of put off by your vibrato when I first heard the band's first album, although I've since warmed up to it. Was that ever addressed by the label? A. I do have a natural vibrato but MCA insisted on speeding up the record’s track (something we were fiercely against) in order to make us sound more “girly” (actual quote). They did it. Period. We didn’t even know until we heard the final master at a “listening party”. We were stunned but had no choice but smile and live with it. As a result, the vibrato is way, way more intense then it should be. My voice on the record sounded much higher-pitched and my vibrato, twice as intense (my speaking and singing voice is much lower and not that screechy). Personally, I was horrified. But, MCA didn't seem to care about that—only that the vocals sounded “girlish”. They also mixed the sound of the drums and bass way, WAY down, which was a big part of our natural sound (originally, easily as intense as Peter Gabriel’s soon released "Shock the Monkey"). Basically, they deflated our overall sound because they worried it was too intense to be “girlish” enough. 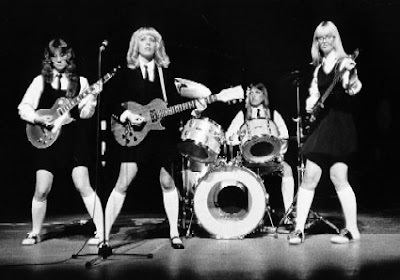 As an all-girl group at the time, they felt you could get away with some loud drums (as long as they sounded light, bright, and airy; you could not get away with loud drums that were low, fierce, and dark. They insisted on a milder, middle-of-the-road sound POV; not a modernized in-your-face POV. Actually, the Go-Go's did have a louder drum sound on their recording and I think MCA would’ve been smarter to follow IRS Records’ lead to let the Go-Go's “beat” out of the box with The Catholic Girls album. MCA seemed to have no such intensity/dark drum problem with The Fixx’s record (again, released later, i.e. "Red Skies"). So yes, we were disappointed. And yes, it was part of the difference of breaking through the invisible “fourth wall” of being viewed by the industry at the time as a “girl-group” vs. a “rock group.” Noted, we do have some have songs that have a more classically girlish sound (which I do like in the appropriate song) like "Boys Can Cry" or "Celebrity Guy" (on "Exposed") but even those have a darker POV lyrically, and live, they have more of a bite than you’d expect at first listen. Q. When/why did the CG break up? A. The CGs broke up a few months after MCA dropped us for the second album. It was a dark time, lots of tensions surfaced, and we were seriously upset about it. It was hard to not be able to continue with the next album and everything we thought we'd be doing. This disappointment opened the doors to all kinds of internal tension and although our songs were ready to be recorded, there was really no way for that to happen. The band broke up and we went our separate ways. I ended up playing with a group of guys in LA and we called ourselves The C.I.A. and we also got precariously close to a record deal also. Q. When/why did you first reunite? A. We got back together in 1999. I had moved back East and got in touch with Roxy. She was having a barbeque and invited me. As it turned out, she had a small stage set up and we decided to play a song together. One song was all it took. We had to play with each other from then on. We got in touch with Leon Tsilis who had originally signed us to MCA but who had been let go during Azoff’s rule and he designed and created a website for the band. Then we eventually looked up Kyd Ellsworth, who had played drums with us on tour with us. Kyd eventually decided to pursue other things (yes, we’re still good friends today) and when she left we found Doreen Holmes, the drummer from the album, and the three of us have been together ever since. Q. Do you keep in touch with Joanne Holland? A. Joanne's been MIA since the band originally broke up and doesn’t want any contact with any of us -- so, no, we don’t keep in touch. We all took the whole MCA situation very hard and being dropped brings up a whole well of mixed, often hard feelings for everybody involved. Q. I am really enjoying the latest CD -- especially “It Doesn't Become You.” How did you decide to re-record “Called You Up”? A. We wanted to redo one song from the first album so we took a poll on our site and asked fans. “Called You Up” was the song that got the most votes with “A Boy For Me” coming in second. Q. What's next for the Catholic Girls? It doesn't seem you've played many live dates recently-- or your site hasn't been updated! A. We haven't been playing many live dates lately. Truthfully, I was completely out of touch for months because I’ve been writing a two new novels (some people don’t know I’m a published author) and I had to take some time off in order to concentrate on the novels, but now, thankfully, I can concentrate again so my first “coming back” volley became to promote “The Catholic Girls Exposed!” and that's going great now. I agree, the landing page hasn’t changed much, but we have now been adding to the website in various places, but mostly in adding Exposed info, reviews, comments, photos and things like that. We've now been reviewed favorably and have been added to radio stations both major, college, and internet in the US and now, abroad too. We'll see about doing some live appearances once the weather gets a little better because we've had a lot of offers. So you never know -- I have the feeling you could be seeing us back in NYC soon!